Beirut (Agenzia Fides) - The debate on civil marriage has stirred tensions in Lebanon after the newly appointed interior minister, Raya Hassan, reignited the issue for its recognition by religious authorities. 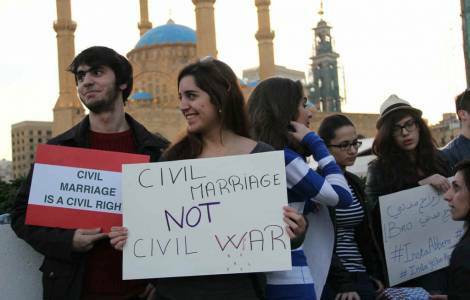 A previous phase of confrontation on the issue of civil marriage took place in Lebanon between the end of 2012 and the beginning of 2013. Then, as reported by Fides (see Fides, 07/2/2013), the public discussion had rekindled when a couple, belonging to Shiite Muslim families, had signed their civil marriage contract before a lawyer and not before a religious court.